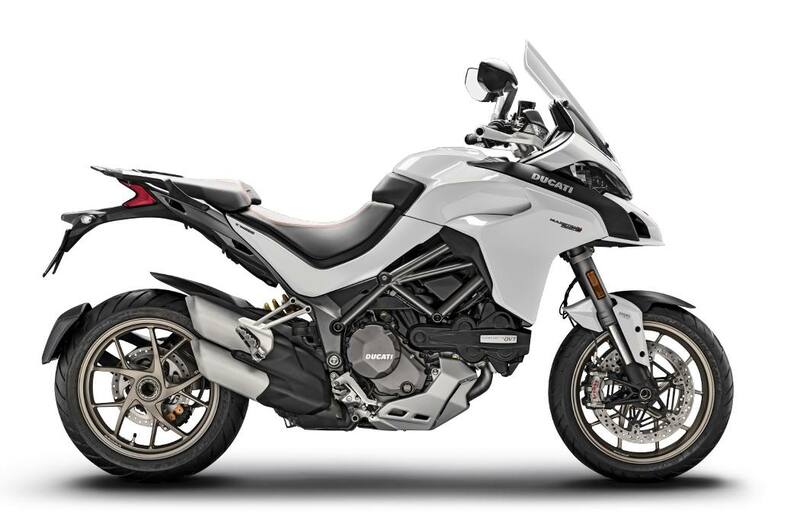 Multistrada 1260 S: the maximum on any road: The new Multistrada 1260 S increases riding pleasure thanks to the new Ducati Quick Shift, it is comfortable for long trips in pairs, great fun off-road and super responsive on urban routes. The new colour TFT instrument panel features allow you to quickly switch between Riding Modes and adjust all the motorcycle parameters, including the Ducati Skyhook Suspension. The new Multistrada 1260 S adapts to every situation to get the maximum out of every road. Standard equipment: Vehicle Hold Control (VHC), Riding Mode, Power Mode, Ducati Safety Pack (Cornering ABS Bosch + DTC), Ducati Skyhook Suspension (DSS) Evo, Ducati Wheelie Control (DWC), Ducati Quick Shift (DQS) up/down, Cruise control, Hands-Free, Backlit handlebar controls, Ducati Multimedia System (DMS), colour TFT display, Full LED light, Ducati Cornering Lights, Automatic indicator switch off, Anti-theft ready. Front wheel: 5-spoke Y-shape cast light alloy 3.50 in. x 17 in. Rear Wheel: 5-spoke Y-shaped casted light alloy 6.00 in. x 17 in.